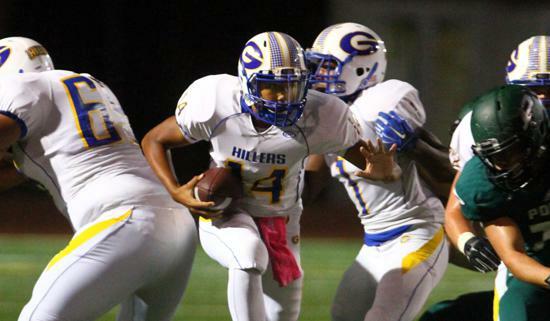 Grossmont quarterback Hunter Gaines charges through a hole. Key players: Oscar Valenzuela (LB), Dylan Helmholtz (LB), Connor Roosa (RB-LB), Dominick Salazar (OL), Jared Stone (OL-DL), Tanner Donahue (OL), Jeff Abbott (OL), Javier Vidalez (WR), Phoenix Cates (QB), Yaphet Yokley (RB). Scouting report: After a heartbreaking loss in a state championship bowl in 2014, the inexperienced and injury-plagued Vaqueros fell on hard times last year — shut out four times after only one blanking in Burner’s entire previous career. The coach is confident things have changed. “They have a mindset that last year was a fluke,” he said. Four three-year starters on the offensive line — Stone, Salazar, Donahue and Abbott — provide protection for Cates to throw and Roosa to run. Two of the best linebackers around, Valenzuela and Helmholtz, are attracting college scouts and key what should be a knockout defense. Key players: Domonique Guevara (WR), Otto Talataina (OL-DL), Hunter Gaines (QB), Nate Tiapula (LB), Riley Havird (DB), Andrew Mink (DL), Brandon Arms (DL), Justin Smith (OL), Ray Perrault (DB), Chris Laethem (LB), Jailen Bailey (WR). Scouting report: The Foothillers, who were 6-0 to start last year, feature 14 returning starters and a JV (8-2) that won league. Strong-armed Gaines threw for 2,500 yards and 25 TDs and guides a super up-tempo offense that piles up yards (398 avg.) and points (28.5). Guevara (903 yards, 10 TDs) had seven TD catches over 60 yards. Highly recruited Talataina (6-3, 310) is a beast on both lines and will open holes for Shevell Sterling Jr. and James Mackey. Karlo is excited about an improved defense with seven returning starters led by Havird, Tiapula and Mink. Key players: Zeke Noa (TE-LB), Scott Young (WR-DB), Rashad Scott (WR-DB), Blayke De La Rosa (OL-DL), Carson Baker (QB), Kameron Tiumalu (RB-LB), Jordan Jackson (WR), William Payne (OL-DL), Lopaka Rojas (OL-DL), Evan Perkins (WR-DB). Scouting report: Under Troy Starr, the Highlanders won the Open Division championship and graduated a host of all-star players, including all-state performers Nate Stinson, Michael Austin and Mekhi Stevenson. Still, Helix has reloaded and Owens, who spent nine years at Grand Junction High in Colorado and 11 at Colorado Mesa College, inherits a team ranked No. 1 in the section, No. 7 in the state and No. 4 nationally. “I feel like I won a lottery ticket,” Owens said. Baker (six TDs as a backup), Tiumalu, Scott and Young lead an offense that averaged 44.4 points in 2015 with De La Rosa, Payne and Rojas providing blocks. The Scotties were 36-1 in passing tournaments this summer, winning four titles. Noa might be the best player in the section. Kicker Matthias Layton and punter Keaton Chase are excellent as well. Key players: Kyree Woods (OL-DL), Mikel Oliver (TE-DL), Caleb O’Gorman (OL-DL), Thomas Fishburne (QB), Wayne Barela (LB), Colton Larceval (WR-DB), Amir Harris (LB), Sean Miller (OL-DL), Xavier Leasau (WR-DB), Brenden Willis (WR). Scouting report: The Cougars have advanced at least to the playoff quarterfinals in 10 straight seasons, and there is good reason to expect 11. Woods (6-3, 280), Oliver (6-4, 240) and O’Gorman (6-2, 245) are big-time college prospects. Woods is a four-year starter and Ivy League eligible, as is O’Gorman. Fishburne was a pleasant surprise, throwing for 1,800 yards as a sophomore. Steele is big up front and has nine starters back on defense. Its nonleague schedule is challenging with Torrey Pines, Madison, Granite Hills, RBV and Otay Ranch. Key players: Anthony Portillo (WR-DB), Josh McNish-Heider (TE-DL), Jerome Johnson (RB-LB), Brandon Fuller (WR-DB), Jake Sines (OL), Tyler Eastlick (OL), Connor Moser (WR-DB), Josh Hernandez (LB), Brent Burnett (RB-LB). Scouting report: The Norsemen lost to Mt. Carmel in the Division II semifinals last year after finishing second in league, losing only to Helix. Juniors Bryan Madriz and Dennis Dahlin, a transfer from Monte Vista, are battling to replace Phillip Naseh at QB and lead an offense that averaged 30 points last year. Portillo is attracting college recruiters. McNish-Heider, Johnson and Eastlick are three-year starters. Bussey cites more experience on offense, a consistent defense that allowed only 171 points last year and back-to-back 7-3 JV teams as reasons for optimism. Key players: Jovan Bea (RB), Griffin Guinn (RB), Ryan Jewell (WR), Mitchell Carlin (WR), Tyler Wilson (WR), Hayden Roach (QB), Zachary-Thomas Weaver (OL), Oscar Morales (OL-DL), Kevin Ah Key (OL-DL), Philip Cornelius (OL-DL). Scouting report: Switching to the tougher Hills League this fall will be a tall order for the Wolf Pack, who were second in the Valley League last year. Replacing the production of duel-threat QB Spencer Moyer will also prove challenging. Roach, a junior up from the JV, gets the call and has solid returning offensive linemen in Weaver, Morales and Ah Key, plus Cornelius is a talented transfer from Torrance. Guinn (2), Carlin (1) and Bea (1) are the only returners who scored TDs last year.